First, our open, free meeting tomorrow night (Friday, 17th March) at 7.30p.m. 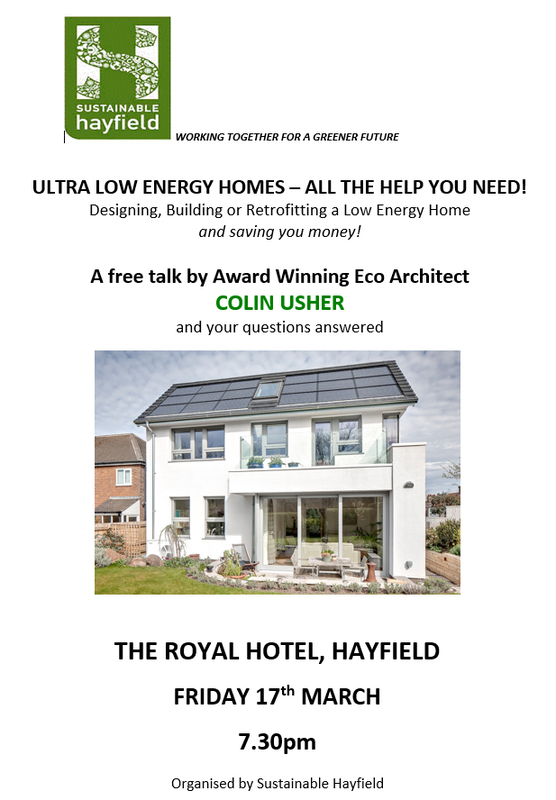 when Eco Architect Colin Usher will be giving a presentation, and answering questions on how to achieve (much) higher energy efficiency in our homes - whether you're interested in designing and building from scratch or, more likely, wanting to improve your your own home's energy footprint - and be warm and save money along the way! Colin's strapline is 'whether you've £500 to spend or £500,000......" Colin's talk and the Q and A is at The Royal Hotel. It should be good! Third, advance notice of a Village Clean Up Day, Saturday 1st April, 10-3.00p.m. Hayfield Civic Trust and Sustainable Hayfield have teamed up, with the active support of the Parish Council and DCC Countryside Ranger Service, to tackle local grot spots, and leave the village more as we'd like it to be year-round. We hope for a good number of volunteers who don't need to be present throughout but can give an hour or two 'to the cause': could you be among them? 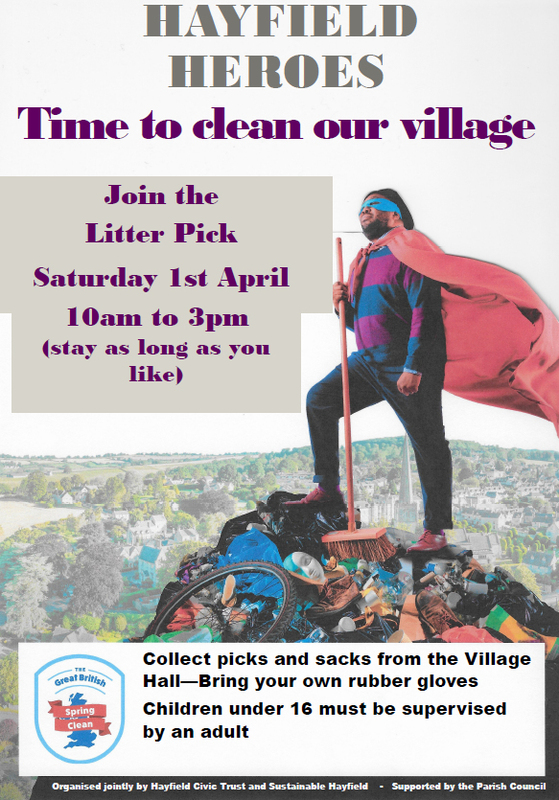 Lots of us moan at litter and detritus around our village.......now's your chance to do something about it! We'll gather at The Village Hall and, hopefully, at Little Hayfield to start our efforts, and there'll be drinks available at The Village Hall throughout. Notices will go up shortly but, for now, please mark your diary and commit to giving an hour or so of your time.........for all our sakes. Getting/Making Your Home (much) more energy-efficient? Ever wondered what it takes to build a truly eco-friendly house? Or how you’d go about making your existing home more environmentally secure, without spending the earth? Help is at hand! 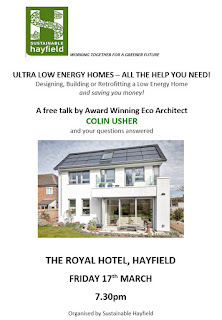 Sustainable Hayfield has arranged a free illustrated talk by award-winning Eco Architect Colin Usher on ‘Designing, Building or Retrofitting A Low Energy Home - & Saving You Money!' It’s at the Royal Hotel, Hayfield, next Friday week, that's Friday 17th March, starting at 7.30p.m. and is open to all. Colin has been involved for many years in the design and construction of houses which are economic to build, very cheap to run and don’t hurt the planet. He was profiled recently in The Guardian for his work, which includes his own family home in Merseyside. Colin’s also a source of much useful information about how to make changes to existing homes to ensure they have a low(er) energy footprint, and are economical and comfortable to run. Much of the UK’s housing stock is, sadly, fairly energy-inefficient and requires costly effort to keep comfortably warm. Although the situation is improving, the number of truly eco-friendly homes is still very small. But Colin is aiming to provide plenty of advice about what’s best to do, and in what order, whether you’re looking to spend £500 or £500,000. He’ll set out the key things to consider, but is keen also to answer questions his audience might have. This should be a good evening, with much to learn, and good tips to take away. Make a diary note now. We hope to see you there!